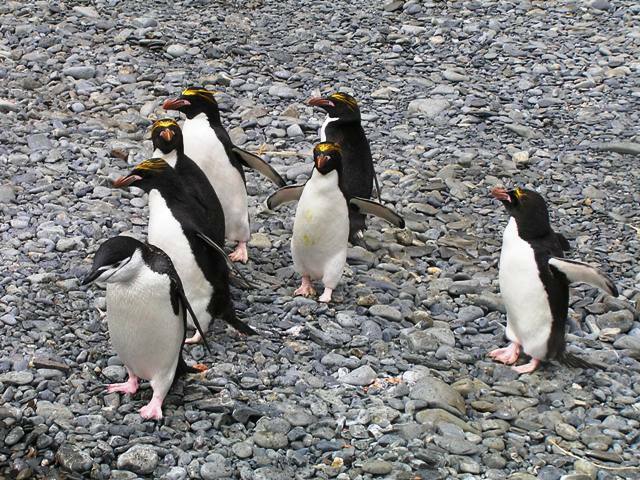 To the untrained eye, this may look like the Macaroni penguins are in hot pursuit of the Chinstrap Penguin. Considering the speed at which they all waddle, this would be a very long chase. But actually, there was one Chinstrap Penguin -- just one -- at almost every single one of our landing sites. I'm not an animal behaviorist, but I do have a theory why one and only one Chinstrap was at each of these landing sites. They are trying to convert the other penguins to their version of penguinism. See, I believe the Chinstraps send out these emissaries or missionaries if you like. Looking closely at the Chinstrap's namesake, doesn't it look like a Jesuit beard? So, a better title would be "The Chinstrap and its Followers."